Sorry for the posts on back to back days, but I wanted to report on the status of the Jersey City Flowage male, released four days ago. He is looking healthy and diving normally, it seems, as this photo by Linda Grenzer suggests. Thanks, Linda, for tracking him down! He has moved about a mile in the large lake where he was released, and has skirted the territory of a pair that nests in the lake. So, while it is far too early to pronounce him out of the woods, things are looking promising. 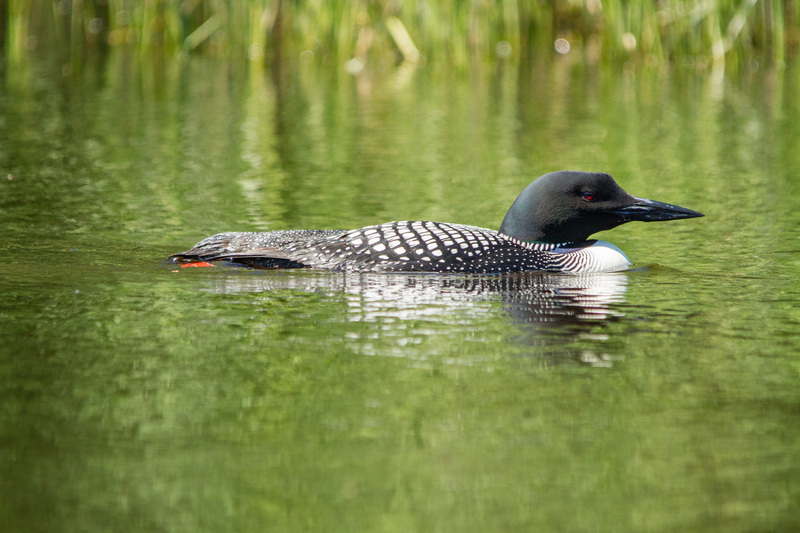 It is remarkable to observe the severe injuries from which loons can recover. 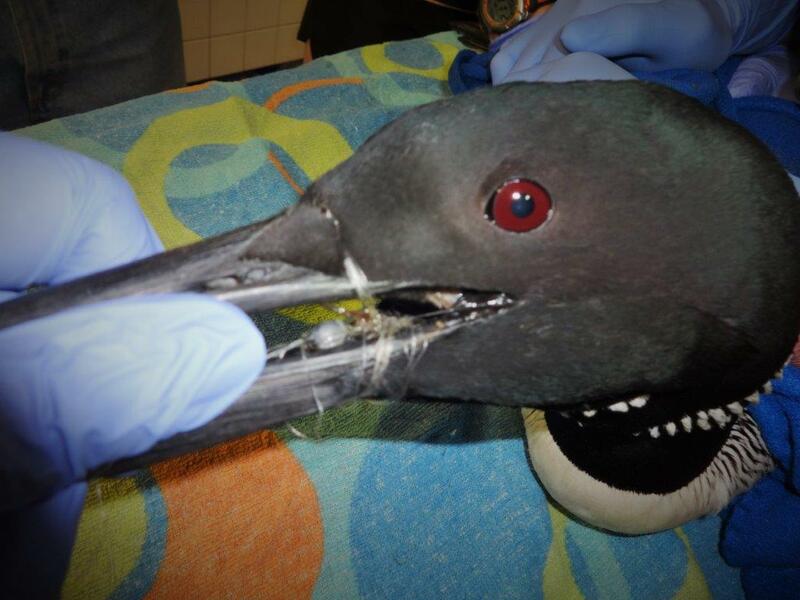 Let us hope that this bird — who has both the brightest bands in the study area and the calmest disposition — can add to the short list of loons that have flirted with death following fishing entanglement, been captured and disentangled, and recovered to become territory owners again. Now…I am a long-time fisherman. Since I was a young boy, I have enjoyed throwing a line in the water and imagining the lunkers waiting to strike my lure. (I think it started with McElligot’s Pool, the fantastic Dr. Seuss book that my parents read to me and my sibs.) I have spent many fruitless hours fishing — and enjoyed every minute of it. 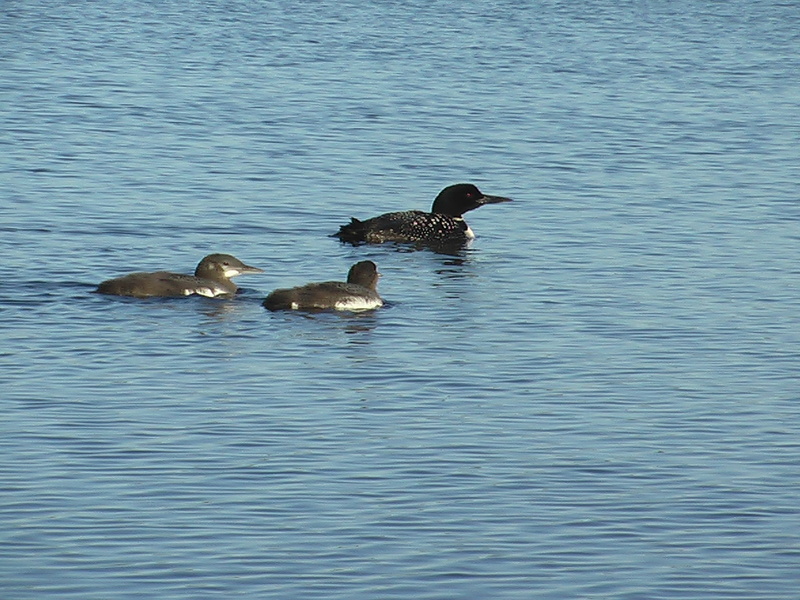 But my lifelong love of fishing has taken some bruises lately, as it has become increasingly clear that many loons in northern Wisconsin die horribly each year after entanglement in fishing line. I discussed some such incidents last year, but we have already had a recurrence of the problem this summer. of the foraging family on that day. Our team noted a month ago that the male had not returned to his territory in 2014. We were disappointed at the loss of cherished individual, but accepted that he had died over the winter or on migration or, perhaps, been evicted by another male this spring. Such are the perils faced by loons. But Marge Gibson of Raptor Education Group, Inc. notified us last week that her group had picked up a badly injured and emaciated male from a lake near Tomahawk, Wisconsin which turned out to be this male. He had swallowed two lead sinkers and, as you see, had become irrevocably entangled in the attached monofilament line. I think that I will always enjoy the unique mixture of natural beauty, solitude, and occasional surge of adrenaline that I have enjoyed while fishing. But I will never again use lead tackle, especially now that there are many appealing alternatives. Help me spread the word about them!